So, you’ve made it to the big time and purchasing a requisite executive sedan is the logical next step. Other members of your club are all driving either an S-Class or 7 Series so you want to go in a different direction. Well, the all-new Lexus LS might just be the alternative you’re looking for. Since its inception nearly 30 years ago, the LS has dutifully played the role of a conservatively styled flagship sedan. But that approach has been upended here. This LS is all up in your grille with one of brashest front ends you’ll ever see. Do I like it? Yes, I do. Would I ever put a front license plate on it? Absolutely not. So where I live in NY that’s problem. It’s longer and lower and in this upcharge manganese luster paint atop these optional 20” wheels, it really presents a stunning design that’s feeding the heartbeat of the reborn Lexus brand. Yes, it kind of looks like designers ran out of inspiration once they got to the rear but all told, this is a head-turner. This all-wheel drive example is the only LS that tops the scales at over 5,000 pounds, making it considerably heavier than the outgoing model. But its stiffer platform, longer wheelbase, new twin-turbo V6 and latest chassis control technology makes this LS more of a driver’s car than ever before. Performance is derived from a 3.5-liter engine with big gains in output – 416 horsepower and 442 pound-feet of torque, helping lop off nearly a full second from its 0-to-60mph sprint, now down into the mid 4’s and about 4/10ths slower than that with all-wheel drive. My car uses the optional air suspension for an even smoother ride and rapid height adjustability, making for a more graceful exit. Sport S and Sport S + driving modes produce an enhanced exhaust note in the cabin and a friskier feel from behind the wheel where the LS delights with its organically engineered big car handling dynamics. It feels light and willing to do what it’s told with effortless acceleration and honed steering. All of these executive sedans now deliver this exceptional balance of luxurious ride and sporty handling but the LS prefers to flaunt its racier side – a new direction for the LS. 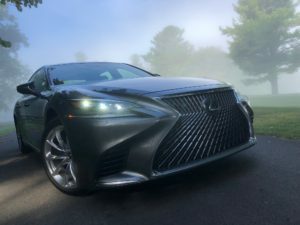 That’s not to say it isn’t quiet and soft when you want it to be, but its new 10-speed transmission and aggressive 20” run-flats don’t produce quite the level of Lexus sumptuousness you might think. In the rarefied air of $115,000 flagship sedans, the LS’s powertrain smoothness and supple ride quality aren’t quite there with the segment leader – the Mercedes S Class. But, it is more fun to drive fast if in fact that’s something you want from a car like this. The LS has taken on a newfound sportiness from behind the wheel with manufactured racy engine sounds and all. It’s this car’s most distinguishing trait. You won’t miss the V8 – this twin turbo is a sweetheart engine, willing to pull every time you hit the accelerator. The 10 speed Auto is manipulated well in the various drive modes, too. It’s a big car that knows how to handle curvy roads with grace. But having driven the updated S Class earlier this year, there’s nothing the LS does that feels cooler or more advanced than that car. For instance if the S560’s ride quality is a 10 The LS’s is a 9. In almost every aspect this Lexus feels like it’s just a step behind. These types of cars don’t stop at just pleasing the driver. It’s actually back here where a good portion of the oh-wow moments appear. Here in the LS these seats are power operated including an ottoman and of course can also provide massage. It should be noted that these features are included in one of the most expensive packages I’ve ever seen; the $23,000 Executive Package with Kiriko Glass adds in the softer leather, 28-way power front seats with amazing massage choices, 4-zone climate control, rear seat knee airbags and of course this beautiful combination of Japanese Kiriko glass and hand-pleated door trim. It’s a wonderful place to spend time and relax to the sounds of the optional 23-speaker, 2,400 watt Mark Levinson reference surround sound system. But, how did Lexus miss the opportunity for an interior light show? There are 2 lame color themes to choose from but as for the wild ambient lighting offered by its competitors, the Lexus is lacking. It would have added so much. So here’s this really sharp looking sedan with sporty intentions and a gorgeous cabin. And then there’s this mess. Such a shame to see a cumbersome infotainment system bring a car down but this is terrible. From the Atari era bonging sounds it makes to its lack of CarPlay and android auto, this is the LS’s biggest fail. The screen is enormous and it looks great but trying to navigate this while driving is distracting and frustrating. On the other hand, the new, optional 24” heads up display is the biggest, brightest and most info-packed I’ve ever tested…it’s really incredible. The optional Safety System brings a taste of autonomous driving with radar cruise control and steering assist but unless you’ve got Cadillac’s Super Cruise with hands-free highway driving you’re playing in the minor leagues. And it may be stupid but you know what else I miss? A nighttime Lexus logo projection. Available in rear- or all-wheel drive and in racier F SPORT or greener hybrid trims, pricing starts at just under $80,000. This one checks in at $115,720. Gas mileage is rated at 21mpg in combined driving on premium. The recently updated S Class is more my type but Lexus has certainly recrafted the LS into something special and different.